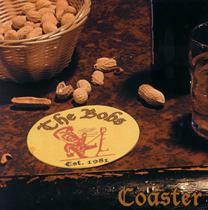 George Graham Reviews The Bobs' "Coaster"
Back in the 1980s, there was something of a renaissance in a cappella music -- voices without instruments. The movement hit its peak in 1988 when Bobby McFerrin had a big hit with Don't Worry Be Happy. And of course, long-running a cappella styles from doo-wop to Gospel had been around long before that along with their practitioners. But the movement to take a cappella to entirely new places stylistically owes much to the Bobs, the San Francisco-based group that this year marks their 20th anniversary together with new recording called Coaster. The Bobs were co-founded by Gunnar Madsen in 1981, a classically trained musician who was about to be laid off from a job delivering singing telegrams. He placed a classified ad looking to form a "nu wave" a cappella group, not really having any idea of what that meant. Among those responding to the ad was Richard Greene, a basso profundo whose voice had been heard on many recordings and advertisements. The Bobs proceeded to lay the groundwork for what would become something of a movement, creating highly distinctive vocal arrangements, often using their voices to simulate the sound of instruments, and composing original material marked by clever, witty, eccentric or downright oddball lyrics, made the more engaging by their intricate vocal gymnastics. Their influence on other groups was strong, from their vocals-as-instruments approach to their quirky lyrics. But while others from McFerrin to Take 6 to Rockapella have achieved more commercial success, the Bobs, whose name by the way comes from a dog-show term "best of breed," have always remained on the cutting edge with their combination of musicianship and originality. Madsen left the group a number of years ago, but they have been creating a stream of one-of-a-kind recordings from amazing collections of vocal cover versions to some downright curious original songs, to some dabbling with added instrumentation. Their new CD, Coaster, their first in over three years, marks a further revision of the personnel, with Amy Englehardt, moving into the female voice position, replacing Lori Rivera, and Gunnar Madsen making something of a return through contribution of material. Original members Richard Greene and Matthew Stull remain, with Joe Finetti, who joined the group in the 1990s, rounding out the quartet. The group's basic premise remains the same -- nearly mind-boggling vocal arrangements, with original material for which the phrase "extremely clever" is a huge understatement. On Coaster, for the first time, they show a little classical influence, taking on Johann Sebastian Bach, and they do some Duke Ellington wordlessly. They also created a suite of songs apparently based on a children's story, and as another Bobs first, perform a song with an arrangement that resembles barbershop quartet singing, but with lyrics that are anything but what you might expect in that kind of musical setting. As they have occasionally done in the past, the Bobs allow some instruments to be present, with a few pieces accompanied by trombone, and one song with a regular rock or pop band backup. As usual, the group's range of voices from the deep bass of Greene to the soprano of Ms. Englehardt, weave in and out sometimes emulating instruments, and sometimes concentrating on delivering the punch lines to their songs to maximum effect. The group has done a couple of albums of cover songs, and with the rest consisting of new material, but this CD has a mixture of both, though the former from unexpected sources. When it comes to creative a cappella music, the Bobs are without equal. Their combination of impressive arrangements, virtuosic performances and witty, offbeat lyrics has for 20 years set the standard for others in the field. Their new CD Coaster, continues the band's brilliance, and expands their style a little with the classical influence, and other more contemporary ingredients. The result is another outstanding record that one can't help but be drawn into. From a sonic standpoint, we'll give the CD a grade A. The quartet's voices blend well in the mix, and some added electronic effects enhance, rather than interfere with the performances. The Bobs prove once again that four people almost exclusively using their voices can make some truly remarkable, and downright entertaining music.